Thriller directed and co-written by Aneesh Chaganty. 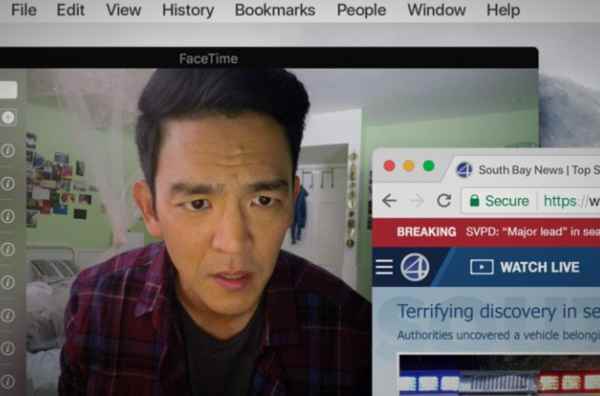 The story is told entirely from a computer screen and centers on a father, David Kim (John Cho), who discovers that his daughter, Margot (Michelle La), is missing. A local investigation is opened and Detective Rosemary Vick (Debra Messing) is assigned to the case, but 37 hours later and without a single lead, David decides to search the one place no one has looked yet, where all secrets are kept today: his daughter’s laptop. As he searches through her web history and interviews people who were supposedly close with her, he begins to learn that his daughter was not as perfect as she seemed. Margot Kim: I’m Margot. I’m fifteen. Student. David Kim: Hi, sweetheart. Where are you? Margot Kim: Study group. I should get back. David Kim: … took today. Margot Kim: I think we’re going to go late, like all night. Margot Kim: Leave me a message or text me. Bye. David Kim: Hi, sweetheart. I’m just checking in because it looks like you already left for school this morning. David Kim: Hey, Margot. Dad again. Why did you leave your laptop at home? David Kim: I haven’t been able to reach Margot. Wait, you can’t find Margot. David Kim: Margot Kim. The school has her marked as absent today. David Kim: My daughter is in a lesson with you right now? Teacher: Margot canceled her classes six months ago. David Kim: I’m calling to report a missing person. 911 Operator: Okay, who is this regarding? Detective Rosemary Vick: I’m the detective assigned to your daughter’s case. I need to know how everything unfolded. Detective Rosemary Vick: One, after study session Margot didn’t return home. Two, she didn’t attend school on Friday. And three, she’s been transferring funds for the last six months. We’ll handle the ground investigation, but as a parent you can help us with who your daughter talks to. Is that something you can do? Detective Rosemary Vick: [to David] Update me whenever you learn something. Female Anchor: Authorities are asking anyone with information to please call the hotline or 911 immediately. David Kim: Do you mind answering some questions for me to help? Margot’s School Friend: I did see her eat lunch alone. Margot’s School Friend: Every day. Peter: You don’t think she’s involved with anything serious? David Kim: I know my daughter. Abigail: Study group only went till nine. David Kim: She said it was going all night. Abigail: No, she definitely left at nine. David Kim: Did she mention anything unusual going on lately? Abigail: We’re not really that close. David Kim: Why did you invite her to study group? Abigail: We’re planning to get into Berkley next year. David Kim: She has friends, right? Margot’s Friend: She keeps to herself a lot. Margot’s Friend: She is quiet. David Kim: When was the last time you saw her? David Kim: She did not run away. David Kim: She made an app going transaction of twenty-five hundred dollars. Detective Rosemary Vick: Margot picked up an ID a few days ago. David Kim: That doesn’t make any sense. Detective Rosemary Vick: It’s time to start considering that Margot ran away. David Kim: I know my daughter. She did not run away. David Kim: She gets a fake ID. David Kim: Where were you the night my daughter went missing?! Detective Rosemary Vick: [to David] Look into her behavior also. Abigail: She was my best friend. David Kim: I’m trying to help you find my daughter! Margot Kim: This is it. The best place to do nothing. David Kim: This is her key chain. You told me she ran away! News Reporter: The vehicle was discovered late last night. News Reporter: Twenty-five hundred dollars in cash was found. David Kim: Something doesn’t add up. Radio Jockey: Has anyone considered that it was an absolute stranger? Detective Rosemary Vick: You can’t see things clearly. David Kim: All I’m trying to do is to help you find my daughter! Detective Rosemary Vick: We need nothing from you. David Kim: Where were you the night my daughter went missing? David Kim: I didn’t know her. I didn’t know my daughter. What do you think of the Searching quotes? Let us know what you think in the comments below as we’d love to know.